Okay, pet peeve of mine in werewolf literature (and dog training, but that’s another topic)– there really is no such thing as “Alpha male/female” in wolf hierarchies, at least not as we think of it in popular culture. Wolf packs are basically just nuclear families. Yes, the breeding pair is dominant, in the same sense that Mom and Dad are dominant (literally so, because that’s what they are). 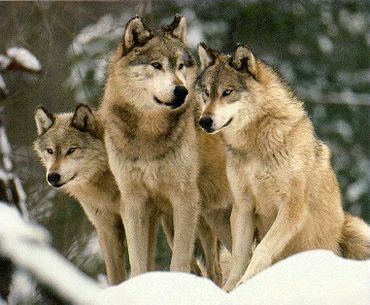 Generally speaking, in a typical wolf pack, you’ve got the breeding pair and the various offspring ranging up to three years old. Typically, the kids get anxy at around 12-24 months old, then “disperse” away from the pack in order to find a mate. What does a wolf pack do when they meet a random adult? Typically, warn it off, and if that doesn’t work, kill it. Occasionally, they will adopt a non-threatening wolf of up to three years old. The only time we see fighting for dominance is in the occasional super pack of up to forty odd wolves. These are comprised of multiple families, and the breeding pairs will fight among themselves for dominance. I suppose a human analogy might be a church social. So where did this whole alpha dominance meme come from? Zoo studies. Think about it– we’re talking about unrelated animals thrown in together in an unfamiliar environment from which they can’t escape. In these populations, we do see fighting for the top, betas who can’t be arsed about the whole thing, and omega scapegoats (who would disperse in the wild, given a chance). That, coupled with our own monkey prejudices about group dynamics (Chimps have a very linear dominance hierarchy) is where all this comes from.